“Thank you for joining me this morning after a long night – and a long few months – for all of us. Yesterday, Scotland – like London and Northern Ireland – voted overwhelmingly to remain in the EU. We voted to protect our place in the world’s biggest single market – and the jobs and investment that depend on it. And we voted to renew our reputation as an outward-looking, open and inclusive country. It is significant – in my view – that we did so after a campaign that was positive about the EU and about the benefits of migration. Indeed, I want to take the opportunity this morning to speak directly to citizens of other EU countries living here in Scotland – you remain welcome here, Scotland is your home and your contribution is valued. Unfortunately, of course, yesterday’s result in Scotland was not echoed across the whole of the UK. The UK-wide vote to leave the EU is one that I deeply regret. But this vote wasn’t just about the EU – it was also a clear expression of the disaffection with the political system that is felt in too many communities. Communities taken for granted by Labour for generations and punished with austerity cuts by the Tories for a financial crisis they didn’t cause, used this referendum to make their voices heard. The Westminster establishment has some serious soul-searching to do – and I hope very much that it now does it. But as First Minister of Scotland I have a duty to respond – not just to the outcome across the UK – but also and in particular to the democratic decision taken by the people of Scotland. And, of course, we face that prospect less than two years after being told that it was our own referendum on independence that would end our membership of the European Union and that only a rejection of independence could protect it. Indeed, for many people the supposed guarantee of remaining in the EU was a driver in their decision to vote to stay within the UK. So, there is no doubt that yesterday’s result represents a significant and a material change of the circumstances in which Scotland voted against independence in 2014. My job now is to act responsibly and in the interests of all of Scotland, and that is what I intend to do. Starting this afternoon, ministers will be engaged in discussions with key stakeholders – particularly in the business community – to emphasise that as of now we are still firmly in the EU. Trade and business should continue as normal and we are determined that Scotland will continue now, and in the future, to be an attractive and a stable place to do business. Our resilience committee will meet later this afternoon to oversee these immediate actions. Secondly, I want to make it absolutely clear that I intend to take all possible steps and explore all options to give effect to how people in Scotland voted – in other words, to secure our continuing place in the EU and in the single market in particular. I intend to discuss all options for doing so. I should say that I have also spoken this morning with Mayor Sadiq Khan and he is clear that he shares this objective for London – so there is clear common cause between us. I will also make a further statement following tomorrow’s meeting of the Scottish Cabinet. 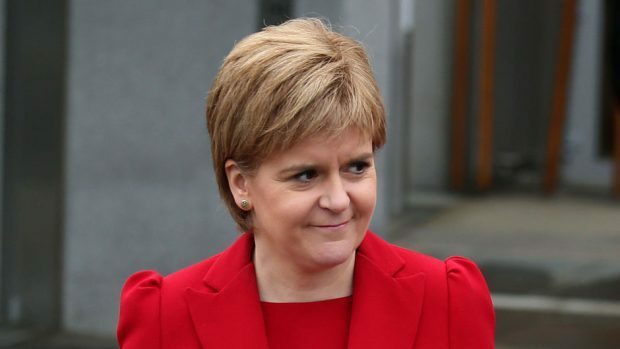 Scotland does now face that prospect – it is a significant and material change in circumstances – and it is therefore a statement of the obvious that the option of a second referendum must be on the table. And it is on the table. However, when the Article 50 process is triggered in three months’ time, the UK will be on a two-year path to the EU exit door. Now, my responsibility in a climate of uncertainty is to seek to lead us forward with purpose. I know that there is a lot of thinking and talking to be done in the period that lies ahead and before final decisions are taken. The issues that we face are complex. There are many people who voted against independence in 2014 who are today reassessing their decision. Indeed, a very large number of them have contacted me already. However, I know that they will not want me to simply assume their support or to hear me talk about the challenges we face as if they are straightforward. They will want me to be straight and honest with them. The need to act decisively must be tempered with the need to build consensus – and it will be. That is my duty as First Minister. After a campaign that has been characterised in the rest of the UK by fear and hate, my priority in the days, weeks and months ahead will be to act at all times in the best interests of Scotland – and in a way that unites, not divides us. And let me also make it clear about this: that whatever happens as a result of this outcome, England, Wales and Northern Ireland will always be Scotland’s closest neighbours and our best friends. Nothing will ever change that. I am proud of Scotland and how we voted yesterday. We proved that we are a modern, outward-looking, open and inclusive country. David Cameron and I have very many political disagreements – not least over the conduct of this referendum.